Walk to beach from this high-finish Folly Field home. Great floor plan w/generous spaces for family living. Seamless transition between indoors & out w/family rm & kitchen overlooking private outdoor living area w/ paver deck, fireplace, built-in grill, trellis-top entertaining area. Oversized eat-in kitchen w/granite, large center island, bartop & SS appl. Italian tile floors, French doors, tropical landscaping. One of the few homes w/a fenced backyard. 5th row from Ocean, private corner lot, oyster shell drive & 2 car garage. Home was previously on vacation rental with over $75,000 per year gross rentals. The Sea Cloisters Experience is a unique & special one. There has not been a 3BR Sea Cloisters for sale since 2016! You will fall in love the moment you drive down the very private gated entry to Sea Cloister! The expansive oceanfront & pool views are amazing from all the rooms. Enjoy it as it is or remodel it when you're ready. This end unit also has marsh views on the side. The quiet mid island location puts this villa in the geographic center on the Island and everything is close by. Sea Cloisters is a private gated oceanfront community w/64 units, a beautiful Oceanside pool, fabulous views from every villa and a strong regime. DIRECT OCEANFRONT! The views do not get any better than this. A corner villa provides extra windows and a long Southern view of the beach and water. An excellent income producing property or vacation getaway. Many recent updates have been done. Enjoy the lighted tennis courts, oceanfront pool with food and beverage service, on-site restaurant, 24 hour security and more. Direct Ocean front, penthouse. Unbelievable views up past the Westin hotel to down past the Folly. Toes are almost in the sand. This is the one you have been looking for at a great price. Perfect for a vacation home or rental property with very strong rental history. Newer kitchen cabinets, very well maintained, clean and rental ready. Add your own touches and make it your own. HHB&T is an outstanding beach front resort with the largest ocean side pool on the island. Tennis courts, 24 hrs manned security, play area, catch & release lagoon, exercise room, bicycle rentals, Tiki bar, sports bar, Gator'z pizza, convention center, & grilling area. Least expensive single family home within walking distance to beach on Hilton Head Island. Diamond in the Rough! Needs some remodeling but could be a great Beach Getaway or a super one level home for Primary or second home or Rental. 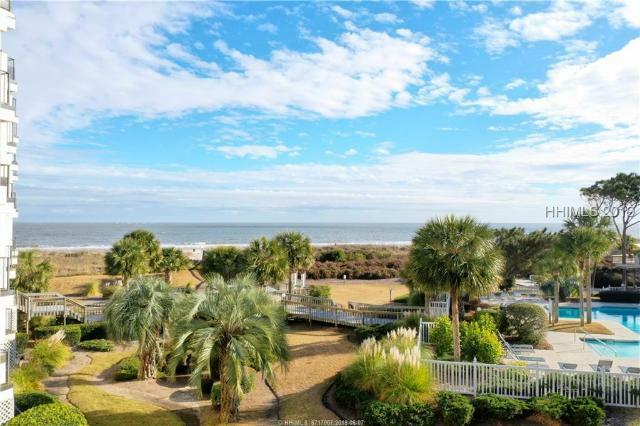 Folly Field Neighborhood has no HOA fees & easy bike ride or walk to the beach! 70 x 100 lot size perfect for future pool with great privacy. Super convenient location centrally located on Hilton Head Island. Just minutes to over 300 restaurants, shops & parks/recreation! Compare to Villa prices, this home makes economical sense with no monthly regime fees. Owners have loved this home since 1978! RARE 3 Bedroom, 2.5 Bath FURNISHED Stones Throw Unit! Unit is TURN-KEY furnished and ready for your beach home or the rental market. Located in a small, quiet community with lots of privacy and a short walk to the Ocean. Features include a back porch area, front fenced-in courtyard, on-site private pool steps from the villa, a large kitchen with Stainless Steel appliances (including a full size Washer & Dryer). Very well maintained as the owners only used the Villa as a second beach home. The unit has NOT been on the rental market. A furnished three bedroom unit this close to the ocean at this price WILL NOT LAST! ONLY 2 bedroom in front Admirals Row building! Convenient first floor and you can even see the top of the ocean! So close to the beach! Very strong rentals over $22,000. HVAC just 1 year old. Water heater 5 years old. 18" tile throughout except in bedrooms. Four ceiling fans! new frig in 2017 with icemaker. Stove (flattop) and microwave 2016. All it needs is new paint!